Building 2 or the north building, renamed "White Hall" in 1883. 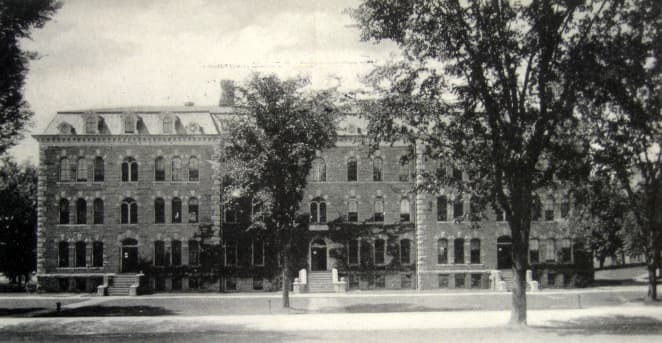 Cacadilla Hall, built in 1866-68 and originally intended to become a water cure sanatorium financed in part by Ezra Cornell, was the first building to be finished for Cornell University. It was used as the main dormitory for students. It also housed faculty (including A. White until the completion of the President's mansion in 1872) and the administrative offices. Building 1 or the south building, later Morill Hall, was built in 1867-68 and was barely ready for the opening in October 1868. Building 2 or the north building, later White Hall, was still in construction at the opening and was probably finished in 1869. For several years, these buildings were used for instruction and as dormitories. In 1884, the board of trustees assigned "Room Q" in White Hall to the Mathematics Department. The department remained in White Hall until moving to Malott Hall in 1999. For the years 1959-1961, the department was in Lincoln Hall due to renovations of White Hall. Evans was born in Swansea, South Wales, on January 6, 1827. His family emigrated in 1833 and settled in Bradford, Pennsylvania. He graduated from Yale, B.A. 1851, with high honors, and M.A. 1854. In 1857, he took a position at Marietta College, Ohio, were he held the Chair of Latin and Mathematics until 1867 when he became the first professor elected by the Cornell Trustees to join the Cornell University. In his autobiography, Andrew White comments that he knew Evans from their years at Yale as not only one of the best scholars in the class of 1851, but also one of its foremosts writers. On the opening of Cornell on October 7, 1868, Evans and Assistant Professor Ziba H. Potter were the two instructors in charge of teaching mathematics to the four hundred enrolled students. Evans served as Chair of the Department of Mathematics until his death on May 22 1874. James E. Oliver was born in Portland, Maine, on July 27, 1829, and grew up in Lynn, Massachusetts. In 1846, at the age of seventeen, he entered Harvard College, passing into the sophomore class. His Harvard room-mate, Horace Davis who would become the President of the University of California said Oliver was a remarkable man in many respects. He had a strong individuality, amounting almost to eccentricity. He was sturdy and independent in his thought, determined and conscientious in his conviction, yet he was modest, retiring in his demeanor, and his extreme nearsightedness increased this tendency… His first love, of course, was mathematics, and next to that came ethics and moral philosophy… Oliver graduated in 1849 and his teacher, Benjamin Peirce, proposed he should accept a position with the Nautical Almanac Office. He remained in this position until 1869 when the Nautical Almanac Office moved from Boston to Washington, DC. In the spring of 1871, Oliver accepted an assistant professorship at Cornell and moved to Ithaca in the fall. He was promoted to the rank of Professor in 1873 and, at Professor Evans death in 1874, he became Chair, a position he kept until is death in 1895. Oliver was the first Cornell mathematician to supervise graduate students. He was a fellow of the American Academy of Arts and Sciences and member of the National Academy of Sciences. His vision of the mission of the department, which included graduate studies, scholarship and research, shaped the future of Mathematics at Cornell. Wait was born in Highgate, Franklin Cty, Vermont, on February 8, 1846. In 1870, he graduated from Harvard, A.B., and accepted a position at Cornell. In 1873-74, he served as U.S. Consul at Athens and Pirasus, Greece, before returning to his position at Cornell. In Ithaca, he is remembered as one of the two Cornell Professors who founded the Cascadilla School. His unusual ability as a teacher and organizer led to his promotion in 1877 to the Associate Headship of the Department, relieving Professor Oliver of much of the administrative work. He became sole head at Professor Oliver’s death in 1895 and remained in this position until his retirement in 1910. Wait Avenue which forms a crescent off Thurston Avenue is named after him. He passed away in 1913 in Clifton Springs, Ontario Cty, New York. McMahon was born in Ireland in 1856. In 1881, he graduated from Trinity College, Dublin, with two gold medals and highest honors in Metaphysics and Classical Studies and was awarded the Wray Prize (Metaphysical studies) and Trinity’s Brooke Prize (Classical Studies). He received the degree of A.M. in 1890 (when already in Ithaca) and an honorary D.Sc. in 1918. McMahon arrived in Ithaca, New York, in January 1883, serving as an examiner in the Mathematics Department and as an instructor in Logic for Andrew Dickson White’s “Correspondence University”, a distance learning initiative. He was active in the American Mathematical Society and in the Association for the Advancement of Sciences, serving as General Secretary in 1899 and Vice-President in 1901. He was also one of the early organizers of the Sigma Xi Society. An expert in special functions, he advised graduate students interested in Mathematical Physics. He died in Ithaca in 1922. His work “Hyperspherical Geometry; and its Application to Correlation Theory for N Variables”, 15 Biometrika 173–208 (1923), was published posthumously. Hutchinson was born in Bangor, Maine in 1867. He was educated at Bates College, (A.B., 1889), Clark University (1890–92), and the University of Chicago where he defended his Ph.D. under Oskar Bolza in 1896. He and L. E. Dickson received the first Mathematics doctorates awarded by the University of Chicago. During his 41 years of service, Hutchinson was one the most visible mathematicians in the Department. He spoke at the 1904 international meeting of mathematicians held in connection with the World’s Fair at St. Louis and was an invited speaker at the 1924 International Congress of Mathematicians, in Toronto. He served as Vice-President of the American Mathematical Society in 1910. V. Snyder writes Among his original productions, two achievements deserve particular mention for their permanent value and the attention they attracted here and abroad: the introduction of the isometric circle in connection with automorphic functions, and the discovery of the infinite group of birational transformations of the general Kummer surface… Hutchinson died in 1935 in Ithaca. The Hutchinson graduate fellowship is named after him. Snyder was born in Dixon, Iowa in 1869. He graduated with a bachelor's degree at Iowa State College in 1889. He attended Cornell as a graduate student but went to study mathematics in Germany on an Erastus W. Brooks fellowship. In 1895 he received his doctorate from the University of Göttingen under Felix Klein and returned to Cornell where he stayed for his entire career. In 1938, Raymond Archibald wrote During more than forty years at Cornell University, Professor Snyder has devoted himself whole-heartedly, and with high idealism, to improving the teaching of mathematics, to promoting the welfare of his students and guiding them into research, and to carrying on his own original work in the fields of geometry of the line and sphere, configurations of ruled surfaces, and birational transformations. Indeed, Snyder was an invited speaker at three International Congress of Mathematicians, he served as president of the American Mathematical Society (1927-28) and supervised over forty Cornell Ph.D.s, three of whom spoke at the International Congress of Mathematicians over the years. He was a fellow of the American Academy of Arts and Sciences. He died in Ithaca in 1950. Tanner was born in Fort Plain, NY in 1861. He attended Cornell, graduated in 1891 with special mention for proficiency in Mathematics and was at once appointed instructor. He became Assistant Professor in 1894. He spend the next two years studying at Göttingen under Klein and Hilbert. After his return, he stayed at Cornell for the rest of his Career. He received a Ph.D. from New Hampshire College in 1901. He served as Treasury of the American Mathematical Society from 1908 to 1920. In 1920, Mr. and Mrs. Tanner made an important gift to promote mathematical research and instruction at Cornell. He retired in 1926 and passed away in 1940. Sharpe was born in Warrington, England, in 1870. He attended Christ's College and received his B.A. from Cambridge University in 1892, finishing runner-up to British astronomer P. H. Cowell in the Wrangler ranking. After lecturing at Queen’s University, Kingston, Ontario, he came to Cornell as a graduate student in 1905. He received his Ph.D. under James McMahon in 1907 and stayed at Cornell for his entire career until his retirement in 1938. He became one of the main collaborator of V. Snyder but always kept a keen interest in Mathematical Physics. Robert W. Burgess who became Director of U.S. Census Bureau, 1953-1961, was one of his Cornell students. Sharpe passed away in Ocean City, NJ in 1948. Hurwitz was born in Joplin, Missouri in 1886 and graduated A.M. from the University of Missouri in 1906. He went to Harvard and won a Sheldon Traveling Fellowship, which enabled him to study at the University of Göttingen. There, he earned a doctorate under David Hilbert in 1910. 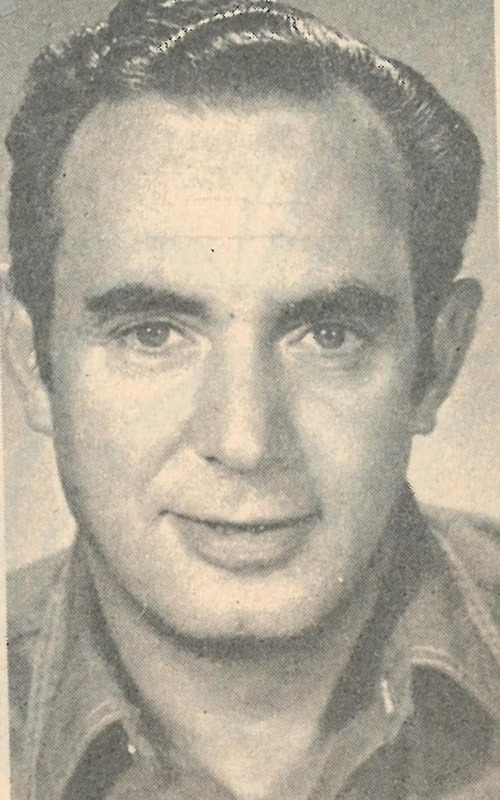 That summer, Hurwitz joined Cornell University where he remained until he retired in 1954. He was a classical analyst, specialist of divergent series and summability methods, and collaborated with David Gillespie and L. L. Silverman. Before World War II, he was the second most prolific Ph.D. advisor in the department after V. Snyder. Ralph Agnew (Cornell) and Robert Cameron (MIT, Minnesota) were among his most successful students. He passed away in Ithaca in 1958. Carver was born in Town Hill, Pennsylvania, in 1879. He graduated from Dickinson College in 1899 and obtained his Ph.D. at the Johns Hopkins University in 1904 under the algebraic geometer Frank Morley. He came to Cornell in 1906 and stayed until his retirement in 1948. His career was dedicated to education. He was a charter member of the Mathematical Association of America and served as President of MAA in 1939-40. He served as Editor in Chief of the American Mathematical Monthly. His contributions to this journal span a period of fifty six years. In Carver’s obituary in the Monthly, R. Walker writes Walter Carver made no pretense of being a research mathematician. At the dinner honoring his retirement, he remarked that he had decided early in his career that his most useful role would be that of teacher and counselor. He felt that he had worked hard along these lines and that he need have no regrets at the part he had played in his university and in the world of mathematics. Carver died in 1961 in Ithaca. Gillespie was born in Knob, Virginia, in 1877. He graduated in 1900 from the University of Virginia and received his Ph.D. at Göttingen in 1906 under David Hilbert. He spent his entire career at Cornell, starting in 1906. He was an analyst and had interest in applied mathematics. Among Gillespie's Cornell students are John Fitz Randolph (later Chair at Rochester University) and the Canadian mathematician Ralph Lent Jeffery, later president of the Canadian Mathematical Society (the department of Mathematics and Statistics at Queen’s University is housed in Jeffery’s Hall). Gillespie died in Ithaca in 1935 while being Chair of the department. Agnew was born in Poland, Ohio in 1900. He graduated from Allegheny College and received a M.A. from Iowa State University. He came to Cornell in 1925 as a graduate student and immediately served as instructor in Mathematics. He received his Ph.D. in 1930 under W. Hurwitz. For two years, he was a National Research Fellow, working at the University of Cincinnati, Brown and Princeton before returning to Cornell where he spent the rest of his career. In the Enigma of Chance, Mark Kac write During his ten years as chairman, Ag, as he is called by his friends, brought about at times, at considerable personal sacrifice, changes in outlook and attitude which prepared the way for the mathematics department to become one of the leading departments in the country. Ag was a very good mathematician and a superb administrator. Agnew is often credited for attracting Mark Kac, William Feller and Wolfgang Fuchs to Cornell. He died in 1986. Robert Walker was born in Pittsburgh in 1909. After attending Carnegie Institute of Technology he went to Princeton were he received his Ph.D. in 1934 under Solomon Lefschetz with a dissertation titled “Reduction of the Singularities of an Algebraic Surface”. He took a position at Cornell and arrived in September of 1935, one of a cohort of five fresh Princeton Ph.D.s to join the department between 1934 and 1938 (the others were William Flexner, John Barkley Rosser, James Givens and Fred Ficken). His book "Algebraic Curves" was published by Princeton University in 1950. 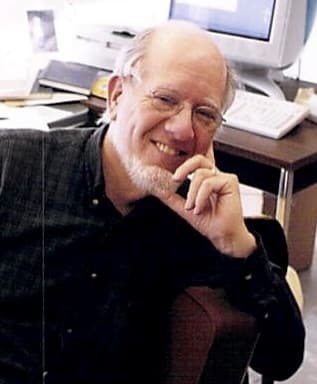 His interests for computers and computations, including for the role they should play in the teaching of science and mathematics, led him to play a role in the early development of Computer Science at Cornell. He retired in 1974 and passed away in Pittsburgh in 1992. J. Barkley Rosser was born in Jacksonville, Florida, in 1907. He received a B.S. and M.S. from the University of Florida and studied at Princeton were he obtained his Ph.D. under Alonzo Church in 1934. He is known for his joint work with Church on lambda calculus (Church-Rosser Theorem), for an improvement on Gödel's incompleteness theorems (Rosser's trick) and for the Kleene–Rosser paradox, a paradox that shows that certain systems of formal logic are inconsistent. In Number Theory, he proved that the n-th prime number is strictly larger than n ln(n) (Rosser's theorem, 1938) and developed what is known as Rosser sieve. During world war II, he worked on ballistics and rocket flight. He became Chair in 1961. Lack of communication with the department regarding his attempt to create a distinct Applied Mathematics Department led to a vote of no confidence and his resignation as Chair in the fall of 1962. He left in 1963 to run the Army sponsored Mathematical Research Center in Madison, Wisconsin. Following these events, in 1964, the Center for Applied Mathematics and the Department of Theoretical and Applied Mechanics where created. Rosser's public service was recognized by a Presidential Certificate of Merit. He served as President of the Association of Symbolic Logic and as President of the Society for Industrial and Applied Mathematics. He spoke at the 1954 International Congress of Mathematician in Amsterdam and was a Fellow of the American Academy of Arts and Sciences. He passed away in Madison in 1989. Paul Olum was born in Binghamton, New York, in 1918. He graduated from Harvard in 1940, obtained an M.A. in Physics at Princeton and joined the Manhattan Project at Los Alamos. He returned to Harvard after the war to complete his Ph.D. in Mathematics in 1947 under Hassler Whitney. A close friend of Richard Feynman, Olum is said to have switched to Mathematics because, compared to Feynman, he did not think he was good at Physics. After a year at the Institute for Advanced Study, Olum joined Cornell in 1949. A specialist of Algebraic Topology and Obstruction Theory, he was one of the founder of the Cornell Topology Festival. After leaving Cornell in 1974, he served as Dean of the University of Texas at Austin College of Natural Sciences (1974-76) and as Provost (1976-1980) and President (1980-89) of the University of Oregon. He died in Sharon, Massachusetts, in 2001. Alex Rosenberg was born in Berlin in 1926 and died in 2007 in Schwerte, Germany. He received a B.A. (1948) and an M.A. (1949) from the University of Toronto, followed by a Ph.D. from the University of Chicago in 1951 with a thesis entitled "Subrings of Simple Rings with Minimal Ideals" written under Irving Kaplansky. After spending a decade at Northwestern University, he came to Cornell in 1961 and stayed for twenty five years. He left in 1986 to become department chair at the University of California, Santa Barbara. Quoting one of his Cornell colleagues I think the most important thing I could say about Alex, beyond praising his mathematical talents and contributions, is that he cared deeply about the profession of mathematics in the broadest sense: from department administration, to teaching, to mentoring graduate students, to helping colleagues, etc. His level of caring was often intense and accounted for much of what might be called his acerbic quality. Rosenberg was a strong supporter of the Cornell Mathematics Library. He was deeply involved in the governance of the American Mathematical Society and was also active with the Mathematical Association of America. Fuchs was born in Munich in 1915. He graduated from high school in 1933, shortly after Hitler came to power. His parents arranged for him to enter St. John’s College in Cambridge and, in 1941, Fuchs received his Ph.D. under A. E. Ingham. He came to Cornell in 1948 at the invitation of R. Agnew and remained for the rest of his career. His fundamental discoveries in Nevanlinna theory, many of them the product of an extended collaboration with Albert Edrei, reshaped the theory and have profoundly influenced two generations of mathematicians. Quoting from the memorial article in the Notices of the AMS His life and career were characterized by an unrelentingly positive and supportive attitude. He read avidly (in many languages), traveled widely, and was devoted to intellectual dignity and the international mathematical community. He passed away in Ithaca in 1997. Oscar Rothaus was born in Baltimore in 1927. He earned his bachelor's degree (1948), master's degree (1950) and doctorate (1958) from Princeton University. He served during the Korean War from 1951 to 1953. From 1953 to 1960, he was a mathematician at the National Security Agency and joined the IDA in 1960, becoming its deputy director in 1963. He came to Cornell in 1966. Rothaus had two careers. The first was in classified cryptoanalytic research. He had the ability to see the mathematics behind cryptoanalytic problems, and to explain it to both mathematicians and cryptoanalysts, often with surprising results. His second career was as a Professor of Mathematics. His primary unclassified research interests were complex analysis, combinatorics, Lie and Jordan Algebras, and Functional Inequalities. He passed away in Ithaca in 2003. Cliff Earle was born November 3, 1935, in Racine, Wisconsin. He earned his bachelor’s degree from Swarthmore College in 1957, and his master’s (1958) and doctorate (1962) from Harvard University. Cliff joined Cornell in 1965 after spending one more year at Harvard and two years as a visiting member at the Institute for Advanced Study on a National Science Foundation fellowship. He became Professor Emeritus in 2005. Throughout his career, he made beautiful contributions to research on Riemann surfaces, quasiconformal mappings, and Teichmüller spaces and served the university and the mathematical community in a variety of roles. He was appreciated and admired by his colleagues for his gentle supporting manner, his rigor and his honesty. He was a Guggenheim Fellow, Distinguished Ordway Visitor at University of Minnesota, Honorary Professor at University of Warwick, and a Fellow of the American Mathematical Society. Cliff was also an active musician throughout his life. He was a serious and excellent pianist. He often accompanied singers or musical groups such as the Savoyards Ithaca (founded as the Cornell Savoyards). A highlight of his musical life was a public performance of Schubert song cycles sung by Thom Baker. He passed away in Ithaca in June 2017. Two former Cornell undergraduates have served as Chair of the Department, John Henry Tanner and the present Chair, Ravi Ramakrishna. Two former Chairs earned their Ph.D. at Cornell, Francis Robert Sharpe and Ralph Agnew.